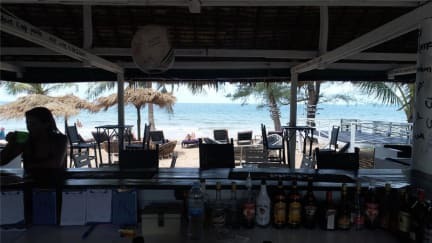 The Easy Panda, Sihanoukville, Kambodża : Rezerwuj teraz! 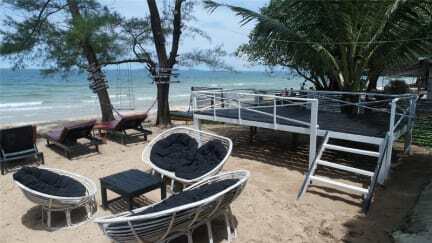 The Easy Panda is a Cambodian owned hostel and perfect for a chilled out getaway. Located right on the most beautiful white sand beach, you will wake up to the most breathtaking view and sleep to the sounds of the waves. This is also the perfect location to view the most beautiful sunset in Cambodia. The wooden/straw beach bungalows finished for a cozy comfortable stay that leads straight to the beach, with double beds, fans and mosquito nets. With sun loungers to relax on and the great beach side service, you'll never want to leave. Complete with a bar and restaurant, the Easy Panda serves delicious Cambodian and Western dishes. The easy going owner will make everyone feel at home and create the perfect atmosphere for your stay; he also makes some of the best cocktails in town! Popular with travelers, locals and expats alike, this is the perfect place to make new friends and have a good time. 5. Smoking in common areas like bar and restaurant is acceptable. No Smoking in the rooms. 6. Age restriction: Children below 5 years of age are not permitted.